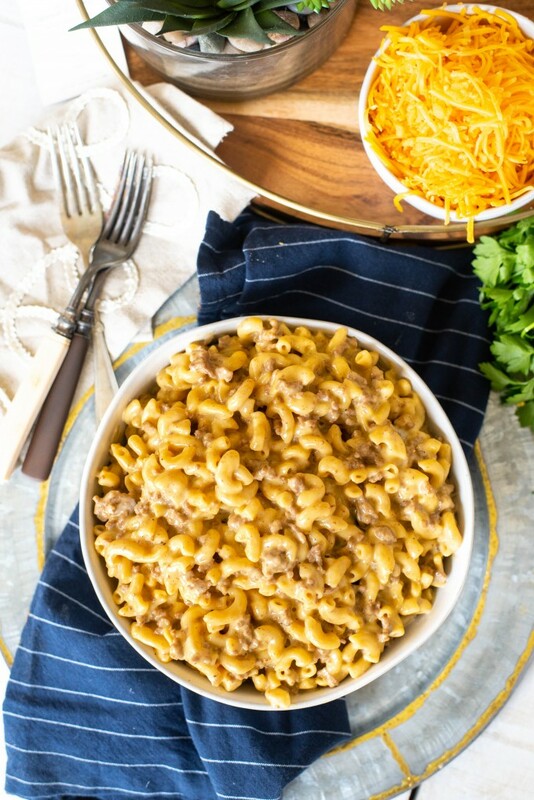 After you’ve tried this easy Instant Pot Cheeseburger Mac, you’ll never want to buy the boxed stuff again! It’s cheesy, creamy, and perfect for busy weeknights! This Instant Pot Cheeseburger Mac is the best easy recipe for busy weeknights. 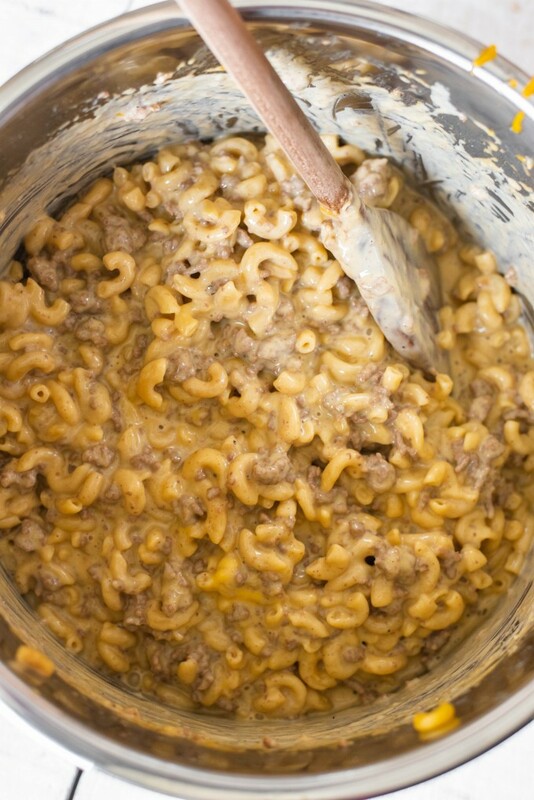 Hamburger Helper doesn’t compare to this homemade cheeseburger mac! Did you ever eat Hamburger Helper growing up? It wasn’t often that my mom made boxed dinners like that, but I did have it a few times. My mom is a wonderful cook, but sometimes even she needed a quick and easy meal to serve for dinner. The few times that we did have it, I really loved it. I mean, with pasta, cheese and beef, what’s not to love right? Hamburger Helper seems to be one of those dinners that every mom defaults to on busy weeknights. Besides the hamburger, everything comes in the box and it’s ready in like 15 minutes. Easy peasy. There have been a few times that I’ve made a homemade version of this family favorite, and it always gets devoured with rarely any leftovers. So in keeping with my Instant Pot theme lately, I set out to experiment with an Instant Pot version. 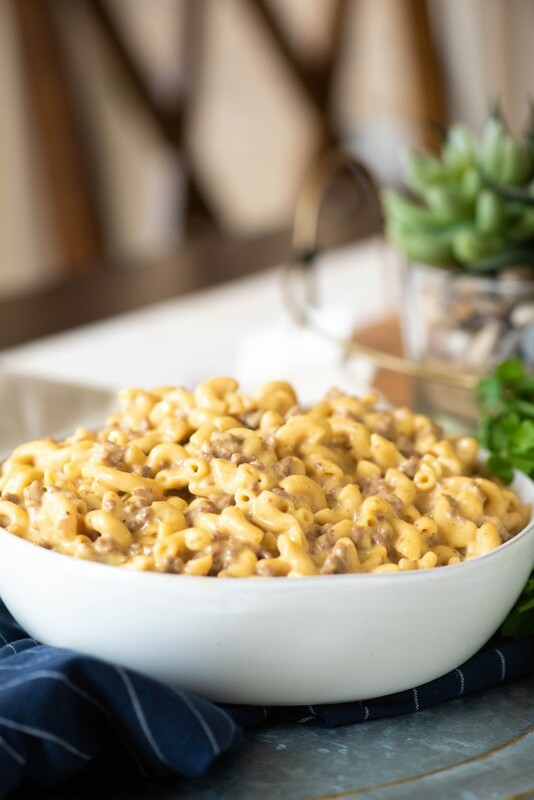 The best part about this Instant Pot Cheeseburger Mac is that it is practically dump and go – and SO quick! It’s everything you want in an easy weeknight meal, plus it’s kid-approved. An amped up version of mac and cheese with beef in it? Yes, please! You are going to love how easy this recipe is! Other than browning the meat, it’s pretty effortless. Just throw all of the ingredients (including the browned meat) into the Instant Pot and you’re done! I used a mixture of Velveeta, mild cheddar and sharp cheddar. That, along with the half and half ensures that this Instant Pot Cheeseburger Mac is super creamy and delicious. Please NOTE: This recipe calls for 4 teaspoons of coarse kosher salt. Do NOT use 4 teaspoons of regular salt- it will be too salty. If you are using regular iodized table salt, start with 1 teaspoon and then do a final seasoning at the end to suit your taste. All you need for this recipe is an Instant Pot! It has easily become one of my favorite kitchen tools, and I’m sure you’ll love it too. Hi there. Do I cook the ground beef first? I think this would be really good, it was easy to make. But..4 tsps of salt was way too much ! If I had made it, I never would have put all that salt in, but my son was making one of his first instant pot meals, and I didn’t catch it in time! It must be a typo! So, its not a misprint, but I DO know where the discrepancy is coming from- I use coarse kosher salt, which I will need to go back and specify. Without getting into a really long winded discussion about it, kosher salt is less “salty” than typical table salt. With the grains of salt also being much larger, it ends up being less salt by weight. When I made this the first time I used two teaspoons of salt (I have found that I need to really season the hell out of things in the Instant Pot because they turn out bland otherwise) and thought it was really lacking in taste. To me, it only tasted right after I added the additional two teaspoons of salt during a “final seasoning.” I’ll make a note in the recipe that I used coarse kosher salt, and if using regular iodized table salt, to start with 1 teaspoon and season to taste. Would it still be 5mins if I double the recipe?! This is way too salty! Is it a misprint? If I had made it, I would never have added the 4 teaspoons of salt as the recipe called for. This was my son’s doing, so, he thought it sounded like a lot of salt, but double checked the recipe and added it all anyway! For me it was inedible! My husband added green beans, and said it was a bit better, and my son ate it with bread and it helped some… I think it will be a great recipe, but will leave out all that salt next time!! I just made this tonight using the amount of kosher salt listed and it turned out wonderful! It’s a big hit in my house! Thanks for the great recipe! We loved this recipe. My question is how many people does this recipe feed and what is the serving size? 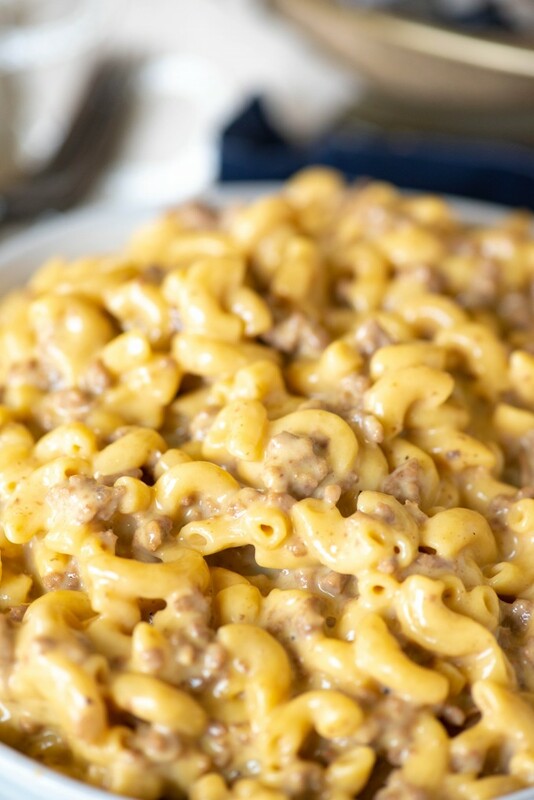 I love cheeseburger macaroni and this will become a favorite recipe. Very good! Very easy to make, it was nice and creamy. Thanks for sharing the recipe.